Aviation can be cruel sometimes. Two weeks ago when I arrived at the airport for my flight from Cuzco (CUZ) to Lima (LIM) the airline agent told me my flight had been cancelled due to “operational issues”. No problem, the airline put me on another flight about an hour or so later. I checked in and went to my gate. My gate was in the downstairs area of the airport, I believe it was gate 10 or 11 at Cuzco’s AEROPUERTO INTERNACIONAL “TNTE. ALEJANDRO VELASCO ASTETE”. At the Cuzco airport you will generally go upstairs to the gate area but because the airport is quite busy nowadays there are some flights that leave from a downstairs gate area as well. The downstairs gates are normally reserved for international departures but occasionally handle domestic flights. The gate area started to fill up with passengers when a barely audible announcement was made about a gate change. The downstairs gates are really spartan and don’t have a PA system, the airline agents have to use a portable PA system at each boarding door. Nobody who was more than 30 feet away from the desk could hear which flight was moved so everybody got up and swarmed the airline desk to ask about the gate change. Turns out it wasn’t my flight but the next one after that. By now it was time for my flight to start boarding and the airline agents tried to get the passengers who had swarmed the desk to form a line and start boarding in a reasonably orderly fashion. Everybody lined up about 3 wide but the agents kept trying to reduce the line to a single file. I thought they were exaggerating and some arguments broke out between the agents and passengers. One of the airline agents raised his voice in a childish condescending kind of way and I told him I wouldn’t have anything of it. The passengers eventually boarded but by now many were not in a great mood, between the earlier flight cancellation and the back-and-forth at the boarding gate everybody was just relieved to finally be on their way. I was seated right over the wing. As the plane took off one of the main wheel tires was shaking badly. I remember thinking I hope the crew writes that up when they get to Lima (for the tires to be balanced by maintenance). I sat back and relaxed. Am I imagining things? No, surely the left engine isn’t shaking now is it? Good grief… These modern airliners never break, they are extremely reliable. I used to work at GE and I can say without hesitation jet engine reliability is just phenomenal. The airplane I was in on that day doesn’t have GE engines (it has IAE V2500s), but the engines are all excellent. So why the heck is this engine shaking so badly??? I tried to relax, surely it had to be my imagination. I closed my eyes for a few moments. The flight attendants started to serve snacks. Yippie!!! My lucky day, the flight attendants were starting out only 2 rows in front of me, chocolate, crackers and a cup of hot strong Peruvian coffee were only mere seconds away now. The lead flight attendant up front rang the intercom and called all the flight attendants back to their stations. No snacks for the moment. The lead flight attendant said something about turbulence and remain seated. I closed my eyes again. The engines are revving up and down a lot. I figured it had to be because the crew was navigating through some convective weather – in early November rainseason has already started over the Andes mountains. We’re about 15 minutes into the 1-hour flight now and the Captain comes on the intercom. Now I’m worried. Not because there’s a mechanical issue, those things happen and there are lots of backup systems, but because he’s turning back to Cuzco. I’m not second-guessing the crew but in most cases if you’re 15 minutes out of Cuzco and 45 minutes out of Lima, you would elect to continue to Lima or Pisco because those are much better airports than Cuzco. Cuzco is one of the more challenging airports to land at due to the elevation and surrounding terrain. In fact, this particular airline has a policy that only Captains are allowed to land in Cuzco. Copilots are not allowed to be the “flying pilot” (the one handling the controls) in Cuzco. So why is he turning back to Cuzco? Either the problem is a nuisance warning that they can’t figure out but has no bearing on the performance of the airplane, or… it’s something really bad and they have to get back on the ground right away. We land back in Cuzco uneventfully and the crew parks the airplane in a corner of the airport. As the passengers deplane I looked in the cockpit and overheard the Captain pointing out some issue with the flight instruments to the maintenance crew. Now the return to Cuzco made more sense: Lima and Pisco are far better airports than Cuzco but the coastal weather typically has haze or low clouds, so if you had a problem with flight instruments those airports would probably not be your first choice – you would elect to go to an airport where you have unrestricted visibility like Cuzco on that particular day. On the other hand if you had a problem with an engine, flight controls, brakes or something of that nature, you would probably chose Lima or Pisco where the airplane has much better performance and the approaches are much easier. While the Captain was pointing out the mechanical problem to the maintenance crew the First Officer (copilot) had stepped out to greet the passengers as they deplaned. He was a young kid of maybe 23 or 24 and looked badly shaken, whiter than white. Airlines down here like to hire young, inexperienced kids because they are more likely to drink the company Kool-Aid. I imagine it was probably the first time ever this copilot had to divert from his normal route of flight. (Read about my most recent diversion here). The Captain looked and sounded confident during the entire ordeal, as he should. When we got back in the terminal a lot of passengers were now really upset but the airline got everybody on the next 2 or 3 flights reasonably quickly. I ended up arriving in Lima about 6 hours late, but sometimes airplanes will do that to you. So what was Peruvian about this entire ordeal? When we filed back into the terminal the same airline agent who had yelled at people before came trudging in, carrying his trusty portable PA system. I was standing by a building column near the desk and the agent plugged his PA system into an electrical outlet in front of me. Only, he didn’t plug it in. His portable PA didn’t have an electrical power plug, it was just 2 bare electrical wires that the young man was expected to wind tightly and stick into the power outlet. I looked at the guy and said, “dude, you’ve got to ask your boss to put a plug on there for you.” Peru uses 220V which is more than enough to hurt a person. I’ve heard stories (not sure if they’re true or not) of people getting killed by 220V electricity and this poor guy was expected to stick bare wires into an electrical outlet probably 8 or 10 times per day, for every time he moves to another flight or gate! I was one of the last passengers on the last flight to Lima that day and just before I got on the airplane the same airline agent came trudging by again, finally on his way out for the day. He shook my hand and said he was sorry about the ordeal but I said not to worry, stuff happens. Cuzco airport photo courtesy of Corpac. 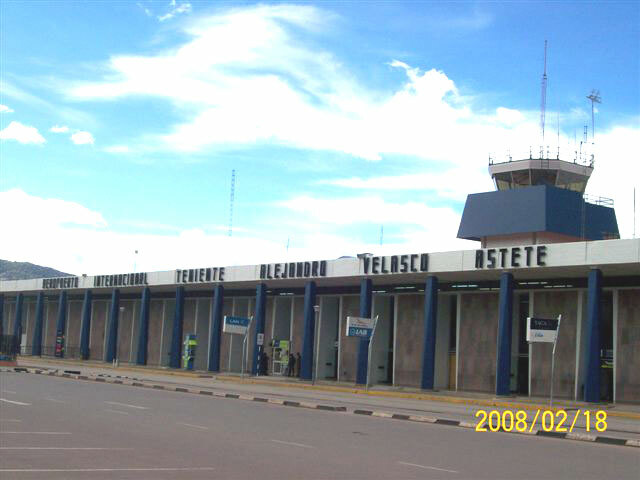 This entry was tagged airline, Cusco airport, CUZ, Cuzco airport. Bookmark the permalink. As for the airline troubles, I honestly think it was just my one-in-a-million unlucky day, because this airline is normally world-class. Domestic airline flights in Peru are nothing like the buses… In my opinion most of the time the airline service on domestic flights in Peru is better than in the US and definitely better than the “low cost” airlines in Europe.